Bleach resistant hand towels-charcoal used in hair salons, nail salons or any business looking for towels which can be washed in bleach. Standard size of 16x26 extra soft and high end deluxe quality. You want to cultivate a posh image for your salon. Whatever services you offer, from waxing to manicures to pedicures to haircuts, you want your business to be a place people want to go. You will do anything you can to improve the perception of your salon. That means investing in accessories that help convey that sophisticated image, such as sweet-smelling soap for the bathrooms, pedicure flip-flops that won't rip or tear and hand towels that stand up to repeated use. For a reliable product you can use for many facets of your business, invest in our charcoal grey bleach-resistant hand towels. Versatile, attractive and durable, these hand towels make the perfect addition to any salon where class and style count. A slew of other businesses also have uses for them. The 16x26-charcoal grey, bleach-resistant hand towels are highly versatile linens with the quality construction to stand up to any and all commercial and home uses. Use them in your gym, salon, health club, employee bathroom, guest bathroom or even at home for the ultimate in comfort, absorbency, and softness. 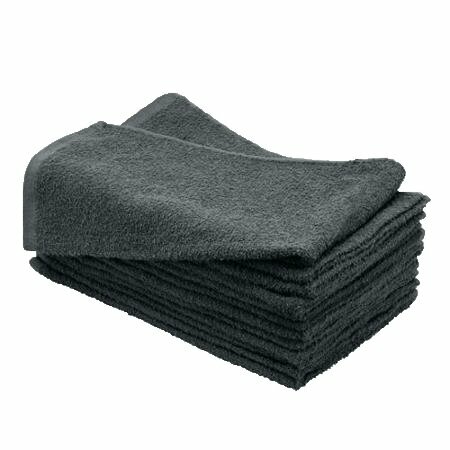 These 100% charcoal grey hand towels are bleach resistant, meaning they stand up to multiple washings while still looking great. You can also bleach them for hygiene purposes, and the color won’t run or fade. The charcoal grey is a classic, ideal for any salon, gym or business. You may wonder what the difference is between a regular hand towel and one that guarantees bleach resistance. The answer is simple. You can wash our towels in a load with bleach, without fear that the color will wash out or streak. That's a wonderful advantage for your business, because bleach provides the deep cleaning you need for hand towels that take a beating every day. Whether you own a gym, restaurant or salon, you expose your towels to bacteria, dyes, organic materials and more. You need to remove all that before you allow those towels to touch a customer. Bleach offers a way to provide that in-depth cleansing, and even after repeated laundering, our bleach-resistant towels come out as fluffy as the first time you washed them. Why Bleach-Resistant Towels in Grey? You can even use these at home. The quality design and soft cotton create a luxurious experience. Towel Super Center lets you buy quality towels online quickly and easily. You pay wholesale prices on all orders, even if you’re just ordering a few items. You can buy as little or as much as you like. If you place a larger order, Towel Super Center offers additional savings. Just contact us to learn more. Why do more businesses and savvy homeowners turn to Towel Super Center when they need linens? The low prices are just the start. We offer a wide selection of towels in every size, style and color, so you can order just what you need. We don't just save you money on new towels. We also provide you with a high-quality product, so you won't need to replace our hand towels frequently. You could waste a lot of money purchasing cheaply made towels that wear down quickly. Instead, invest in our well-made towels meant to work for your business for a long time. You can feel confident in the value you'll receive when you order our towels. We can also handle any size order, even if you need hundreds of towels for your business. Our pure cotton construction and design mean your linens stay fluffy, soft and absorbent, wash after wash. We provide great customer service, too. You can always reach us if you have questions, and you can reorder easily if you need more linens. Our goal is to make buying towels affordable and simple, so order with Towel Super Center today!